Package includes (2) Vehicle tire skates. 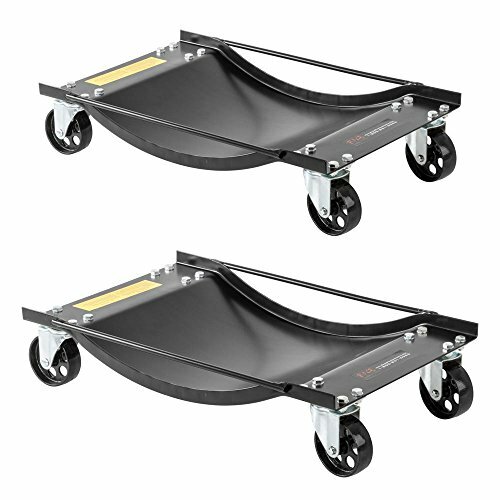 Wheel dolly skates make it easy to move vehicles around the shop, showroom, garage, or along most level surfaces. Each wheel skate is reinforced with heavy duty side rails which also act as integrated carrying handles, and features (4) smooth rolling 3.5"D steel caster wheels which bolt directly to the 23.625"L x 15.125"W platform. Black widow wheel dolly skates have a large 16"L x 14. 19"W revolved tire well area designed to fit most vehicle tire sizes. Maximum 1,000 lb. capacity per wheel skate. BW-WD series wheel skates are made with heavy duty reinforced steel construction built to last with a black paint finish. If you have any questions about this product by Rage Powersports, contact us by completing and submitting the form below. If you are looking for a specif part number, please include it with your message. COLIBROX--Set of 2 1250 Lb. Capacity Vehicle Positioning Car 10" Wheel Dolly Moving Tire. hydraulic wheel dolly. best hydraulic wheel dolly. car wheel dolly autozone. best garage car dolly.